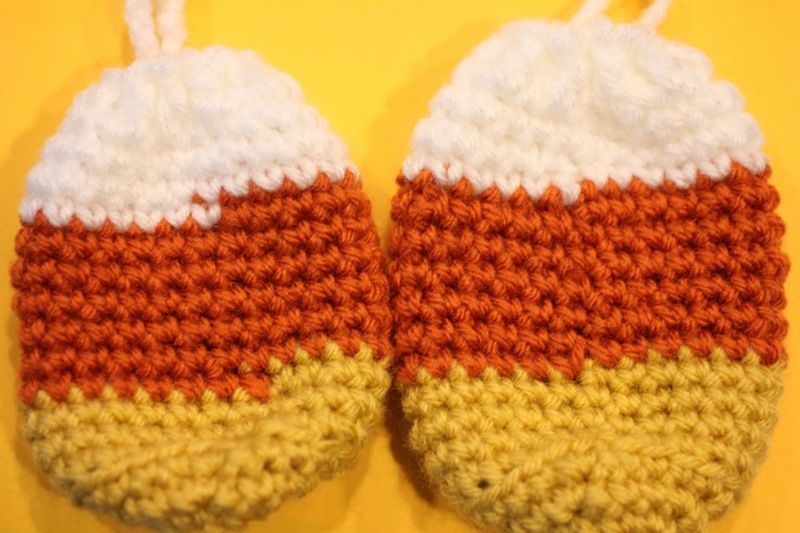 Here is another quick little crochet Halloween project for you! 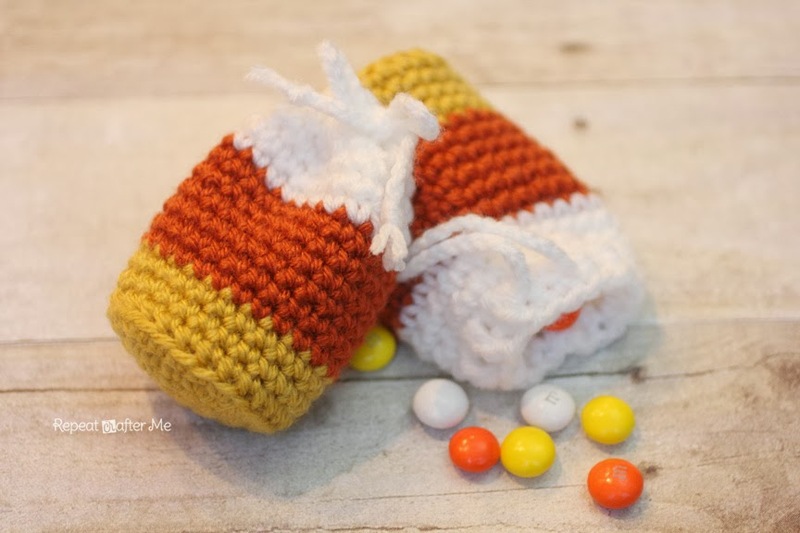 These candy corn pouches are perfect for storing candy treats and would be perfect for a Halloween party or classroom party take-away. – Lion Brand Vanna’s Choice worsted weight yarn in Mustard (yellow), Terracotta (orange) and White. They are approximately 4″ tall and 2″ wide. Starting with yellow yarn..
Rd 5: in back loops only, SC around (25 SC) do not join, continue to SC in rounds. Rd 15-17: SC in each stitch around (25 SC), join, ch 3 at the end of rd 17. The ch 3 will count as your first double crochet. Rd 18: DC in each stitch around. String yarn (I braided 3 strands of yarn together) or ribbon over and under the row of dc’s. Tie in a bow to close. Strand should be about 12″ in long. 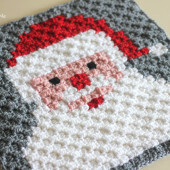 Does it bother you when you crochet in rounds and your rows look staggered? You know, when you switch color and they get that step up stitch? It drives me crazy! 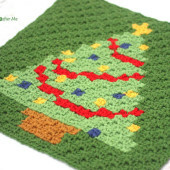 I haven’t found a great solution to this but a better way of hiding it is when you end one color, make a slip stitch to join in the last stitch of that row. In the same stitch begin your new color by making a standing single crochet (you don’t chain 1 before single crocheting). HERE is a great tutorial for this. Here is my before (picture on the left) and after (picture on the right) of the difference this makes. It’s not perfect, but better! 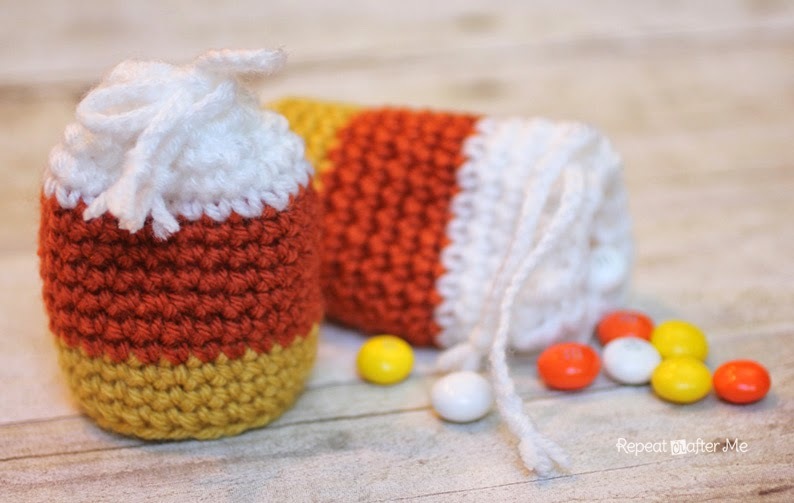 Fill with candy for a sweet halloween treat or small toy, coins or whatever you wish! This is SO cute!! I'm trying to learn to crochet so I can keep my hands busy instead of snacking. I think my girls would each love one of these!! thank you for sharing!! Hi Sarah, this is so adorable. I was trying to find something cute to do for my daughters class and I think I may whip a few of these up and fill them with goodies! Thank you! oh!!! These are way too cute!!!! Thank you for sharing this pattern with us all!!! 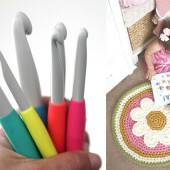 They will be perfect for making a little something for my niece and nephew!!!! You are the best!!! On the Candy Corn pouches, to avoid seeing the color change, you could try to invisibly join and then start with the new color. 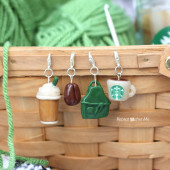 I definitely want to make these and will give it a try both ways and see how that works. Julie from gleefulthings.com made a tutorial on youtube.com about how to invisble join. I believe it adds an extra stich in the process, but it may be able to hide the joining a little better. Let me know if anyone has a chance to try it before me! It seems like I have to try everything you post these days. Everything is so cute! This one was really quick and easy. Thanks for sharing! Very cute. If I want to make a bit bigger would I just increase starting on the ring instead of 10 do like 12 then follow the pattern there after?? ?